Links all twelve games of the series PLUS adds diplomatic, economic, and naval dimension. The War begins with sweeping invasions. Great armies marching to the largest battles yet seen. Murderous fire produces unimaginable casualties. Exhausted, they dig in. The Armies develop Siege Howitzers, Poison Gas, Tanks, and Combat Aircraft. New tactics attempt to overcome the deadlock of trench warfare. Mass Tank Attacks, Storm Troopers, Drumfire Barrages. The war is on multiple fronts. Belgium, France, Italy, Austria, Serbia, Greece, Turkey, Poland, Russia, Romania, Palestine, Mesopotamia. The conflict is much broader than just the battlefields. Factories must be supplied and people fed. Produce the guns, shells and bullets the armies need, or face disaster. 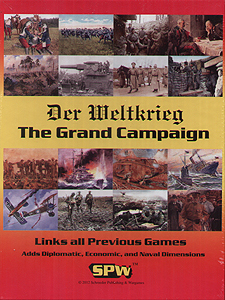 The Grand Campaign combines all of the Der Weltkrieg series titles. Link all of the campaigns together to simulate the entire war from start to finish. All options are now on the table, as you control everything. Simulate the entire war from start to bloody finish. You control the entire war efforts of the combatants. You have control over national war economies. Import coal, iron, and special metals to feed your war machine. Lose control of the raw materials for your industry, and your armies will quickly wither away. World War One could easily have lasted into 1919. Both sides were planning on it. This game allows you to simulate the war into the next year. Additional units, including new tank models, are now included. Players can now fight to the bitter end, whenever that might be. The Grand Campaign includes the territory and forces of the Netherlands and Switzerland. Players can investigate the possibilities of attacks through these wartime neutrals. These options continually worried the General Staffs of both sides. Control new Air and Sea assets that provide strategic options. Move forces between theatres. Set the priorities then put your Grand Strategy into motion. Prove yourself against the test of history!